Imagine being able to visually immerse yourself within the Shakespearean era, using today’s cutting edge technology. we’re talking about virtual reality. 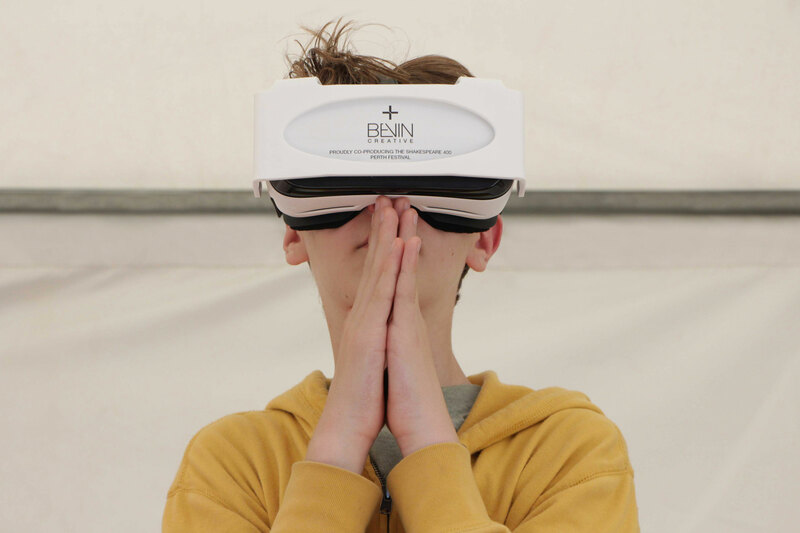 As co-producers of the 2016 Shakespeare 400 Perth Festival alongside fellow co-producers Big Sky Entertainment we set out to modernise Shakespeare by providing a state-of-the-art virtual reality (VR) experience at the October festival finale event. 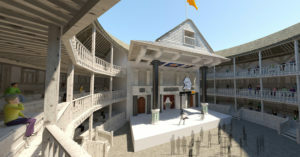 Known as ‘The Virtual Experience’, punters were given the chance to step inside the world renowned Shakespeare’s Globe Theatre, through the use of Samsung Oculus Gear virtual reality headsets. 2016 marked the 400-year anniversary of William Shakespeare’s death, so we honoured the global milestone with large crowds of families, theatre fanatics and arts lovers, converging for a day of roving entertainment, theatre shows, market stalls, music and food. The experience tied into the Shakespeare 400 Perth Festival vision of modernising Shakespeare in today’s society, due to Shakespeare himself being a world leader in creativity, a global influencer and a modern enthusiast who was well ahead of his time. We were humbled by our story getting coverage in various local, national and international media publications including the Australian Energy Review (Page 26) and BUILD Magazine (Page 54). 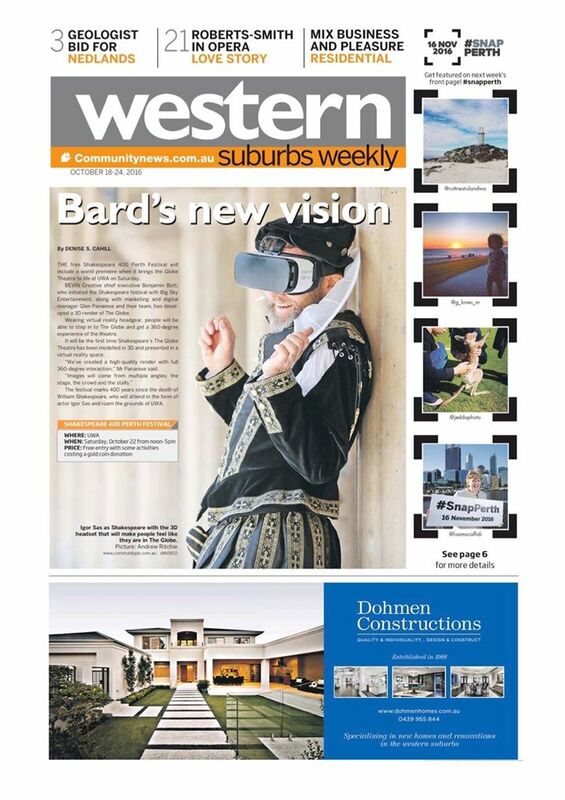 We were even fortunate enough to make the front page of the Western Suburbs Weekly October 2016 edition, as well as having a showcase article posted on the Shakespeare 400 Perth Festival blog prior to the festival finale. We also recently featured on the Corporate Livewire website with an article posing the question Virtual reality and William Shakespeare – what do they have in common? 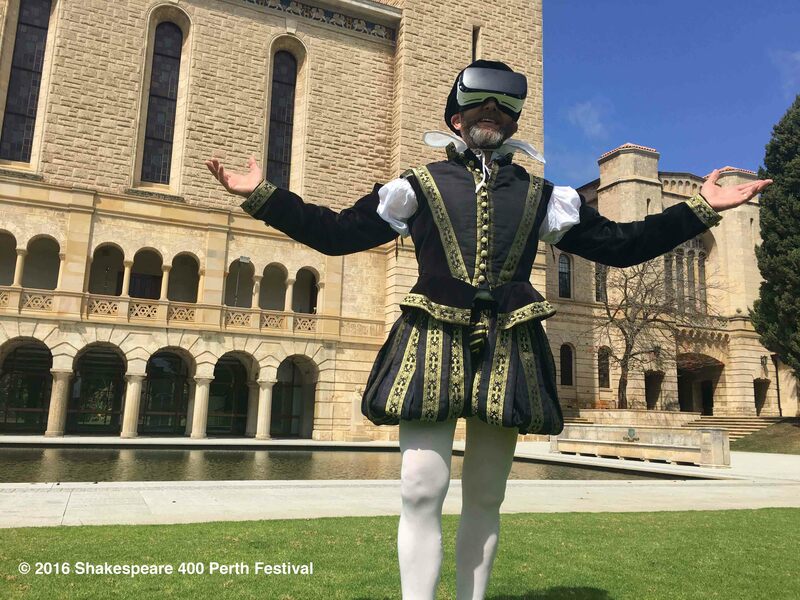 Incorporating modern technology such as virtual reality into an event like the Shakespeare 400 Perth Festival Day, opens the door to a new era in live events. From an industry perspective, virtual reality headsets and systems have been under development since late 2012, with a multitude of investors eager to monopolise on the technology breakthrough. In a recent Superdata report, industry growth figures have projected US$11.8 billion in worldwide revenue by 2017, with US$40.3 billion projected global revenue by the year 2020, indicating this kind of technology is more than a passing fad. The virtual reality craze has also expanded into additional industries like the gaming, travel, drone and fitness industries, who all see promise in this state-of-the-art technology. Whether its virtual reality postcards giving you travel experiences (minus the suitcase and airfare), or fitness equipment that transforms your living room fitness machine into a river rowing challenge in a jungle gaming dimension, this innovative technology is one step closer to being a part of everyday, modern life. With The Virtual Experience being so well received in such a public domain, it has emphasised society’s willingness to embrace new, affordable and relevant technological advancements. Shakespeare never seemed so real.